If you're out and about during the wee hours, with either a naturally occurring or induced hunger, options for appetite gratification are few. Sure, there are some insipid chains that stay open all hours, and then there's Jay's Diner, "The Diner That Never Sleeps" (so say the menus). Open 24/7 and also serving breakfast 24/7, the business has occupied the same spot on West Henrietta Road in West Brighton since 1966. Numerous award certificates adorn the wall near the entrance, many proclaiming Jay's as the destination for late-night eats. Conveniently located near the center of a geographic college triangle, with Rochester Institute of Technology, the University of Rochester, and Monroe Community College at the vertices, Jay's offers a 10 percent discount for students. I've frequented Jay's periodically since childhood, and have dabbled in some late-night food foraging, but these days visits are limited to more mundane lunch and breakfast times, which, judging by the steady flow of hungry people, are equally popular. As a child, I thought the jukeboxes in the booths lining the front of the restaurant were the coolest thing ever, even though my parents never thought my choices were good mealtime music. In an effort to retain a 1950s feel, a few booths do still have jukeboxes, but no longer play 45-rpm vinyl. The teal and salmon décor (seat upholstery, light fixtures, neon lighting) might best be described as Miami Art Deco. Another unique aspect of Jay's are the small, brightly-painted flower pots at each table holding sugar-substitute packets and half-and-half. Each flower pot has stick-on letters that spell out unusual factoids -- such as "starfish haven't got brains" or "in space astronauts cannot cry" -- seemingly derived from the underside of Snapple caps. 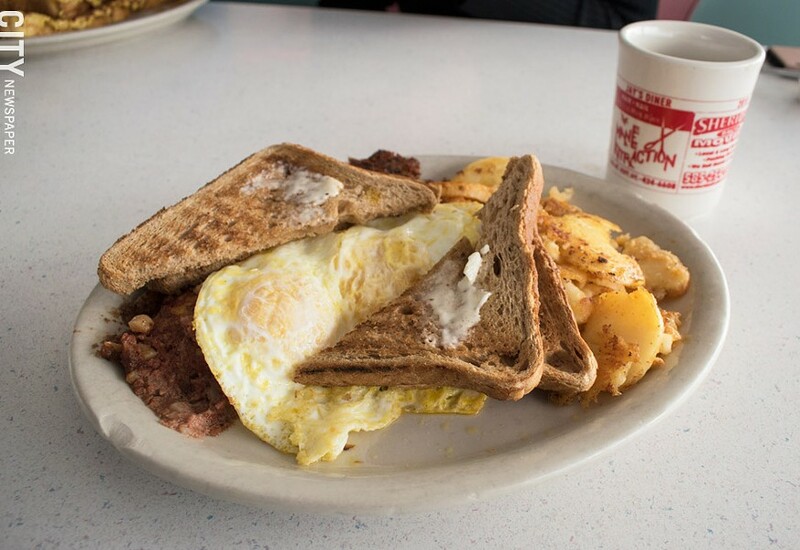 Served 24/7 at Jay's Diner: Corned beef hash with two eggs over easy, home fries, and wheat toast. Dino Mihalitsas, general manager of Jay's and son of owner Paul Mihalitsas, says that after his family purchased the restaurant from founder Jay Leasure in 1985, they committed to retaining the look and feel of Jay's, even after tearing down the original structures in 2001 and rebuilding to make it more accessible. Since those early days, Jay's has been a family affair, dedicated to providing customers with "personal value" and what Dino calls a "special touch" by "still doing things the old-fashioned way, and making everything from scratch," he says. He credits his mother with holding the place together for so long, calling her "the hardest working person you've ever met." Jay's has an extensive menu with a little bit of everything for everyone, but Dino says many people come for the comfort food. As a homemade soup lover, I felt compelled to try Jay's New England-style clam chowder ($4.99/bowl), which has a somewhat legendary reputation, its recipe unchanged since 1966. I didn't care for its gelatinous texture, but apparently, I am among the few. As advertised on the menu, it is loaded with clams, but for me, the chicken noodle soup ($4.25/bowl) -- piping hot, pleasingly salty, with an authentically strong chicken flavor and lots of diced chicken, celery, carrots, and onions -- I had on a subsequent visit was significantly superior. The Philly cheesesteak ($8.99 with fries and pickle spear) I had after the chowder was generously filled with well-seasoned, tender, chopped beef, and a balanced mix of chopped onion and both red and green peppers -- an eminently enjoyable sandwich that could have been even better on a firmer and crustier French bread. In the esteemed tradition of Greek diner ownership in the United States, Jay's offers some Greek dishes, and I savored the chicken souvlaki plate ($13.99 with rice, Greek salad, pita bread, and tzatziki), featuring nicely-charred yet tender, marinated chicken chunks. I appreciated that they prepare a fresh Greek salad that's more than an afterthought and more than mostly iceberg lettuce, with a respectable array of fresh vegetables, feta, and Kalamata olives. I finished this meal with a big vanilla milkshake ($4.99) -- one of my barometers for measuring diner aptitude -- and I judged this milkshake first-rate in terms of just-right thickness, restrained sweetness, and legit vanilla flavor. I returned for breakfast with my girlfriend Molly and her two daughters, Jocelyn and Norah. Molly ordered the seasonal special of pumpkin pancakes ($6.99), which she deemed "a delicious fall treat, not overly sweet or overly spiced." Jocelyn liked that her French toast ($5.99) was "fluffy, including the crust," while Norah declared her Belgian waffle ($6.59) "the best Belgian waffle ever, and I've eaten a lot. It's soft, not crispy and buttery even without butter. I totally recommend it." 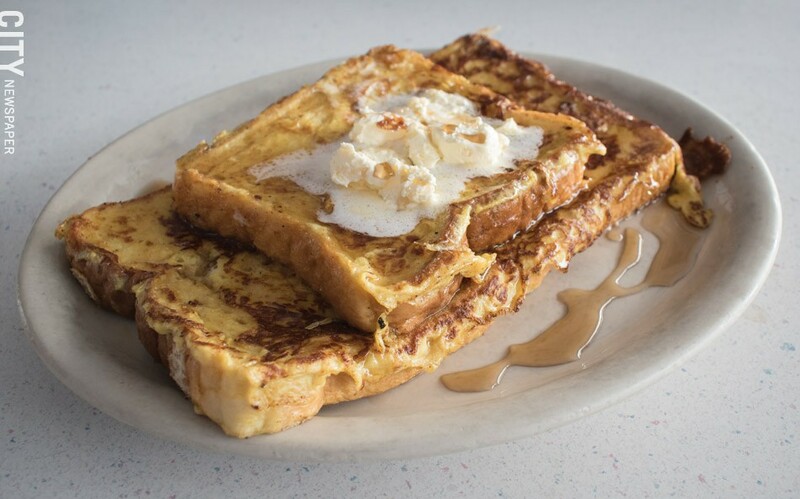 The French toast at Jay's is "fluffy, including the crust." I almost always order corned beef hash ($8.99 with two eggs, toast, and home fries) when a joint makes its own. Jay's corned beef hash was uniformly small-diced and crispy in places from the griddle, but I wished the home fries had had the same crispness. (Side note: requesting home fries prepared crispy seems to be a hurdle for many diners). Regardless of the time of day I visited, the service each time was consistently courteous and attentive, further validating that anytime is a good time to eat at Jay's Diner.